I suppose two reasons for this – 1). Transcontinental competitors in 2014 might be interested, I hope this report from the ‘heat’ of the moment [apologies for the grammar errors, wrote this on about 16 hrs sleep in 2 weeks] helps; mainly what I did wrong! 2). It is an interesting reference of why I want to do the Deca in June. Well that was one crazy trip and now I am into my trip across Asia. So while I wait for my train to Lviv in Ukraine, I am going to pick my head and try to remember the details of those crazy two weeks. As many of you may know, I was struck down by food poisoning tanstalisingly close to the finish (NE Greece) but certainly I will remember a lot more from the trip than the ‘result’. I also hope that the sheer experiences of cycling the distances involved everyday will bring me closer to pro cycling and the industry as a whole. i certainluy hope to engage with cycling clubs when I settle in my new job in Singapore. I also want to use this blog to express my thanks to all those that helped me along the way – including my father, girlfriend, family & friends and all those called upon at late notice to help out – for example my bike is currently being shipped back to Ireland by some very kind family friends. Thank you. And finally, and very importantly, I wanted to express my thanks to those people who donated to my charities – the WWF and Injured Rugby Players Foundation. 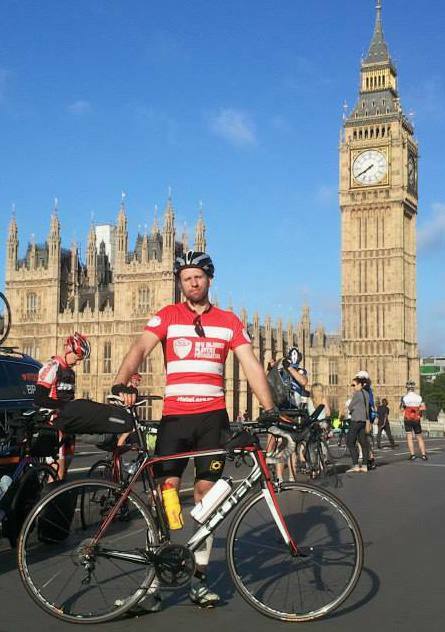 Two fantastic causes and I hope this account justifies your time and donations. Thank you. As I soon found out, keeping a record of the journey is quite frankly very hard. This was a race after all, 2200 or so miles that you are going flat out. You stop to take pictures, that speed average that you just spent the last 3 hours doing in the midday sun is down. That being said lets not be a Nazi about it. The ‘main’ reason for little camcorder footage (I think I have some from the first day or two) is that I didn’t have a dynamo (electricity generator on the bike) so every power point was for the GPS or the emergency battery – and when you are camping in the woods for 2-3 nights in a row, that 30minutes getting refuelled in a cafe to escape the sun or getting a free shower in a friendly hotel goes straight to the GPS! Going to put a follow up article on this but as you will see from the trip review, when you dont have the Garmin GPS as your buddy, assistant, these trips can be filled with panic and ultimately that uses up energy and distracts focus from covering the day’s distance. The Garmin is a wonderful back up to a planned route – i.e. you know the kind of terrain in an area, the main towns, cities. Like every tool in the adventure inbox ultimately every piece of kit compliments or aids another, the GPS is part of your map reading and route planning, a very vital part. It will keep you off very busy roads and will allow for progress even when in pitch black darkness – I had several occasions when 17hrs into a days ride all I wanted was that left or right on the GPS so I didn’t have to ‘THINK’ about directions. But get to know your GPS, I made mistakes because I didn’t use the device to its full advantage and regrettably I only got in the flow later in the race. In addition to the GPS, if you are using it for hours after hours (and the device can last all night) is get a dynamo to charge it. Like all devices it needs to be powered and it can give you the best short cut in the world – missing out big towns etc, just make sure you can keep up with its power demands – don’t worry about the GPS, it will know all the roads you can ever imagine. Very accurate, and got me out of very sticky situations. Press commitments first on the bridge at Westminister, 31 or so riders eagerly anticipating the start of the toughest solo bike race in Europe. It was tremendously exciting and thanks to some dear friends I was not tired from last minute planning (I took myself off to bed while they put together final maps etc, thank you again! ), I couldn’t wait. Day one turned very much into team racing, ie. everyone was going to the same checkpoint in Geraardsburgen in Belgium (where all the cobbles are for the Tour of Flanders) and so we found ‘sharing’ resources, maps, drafting etc seemed to come into play. I certainly enjoyed setting a pace in northern France and Belgium – logistics is not my strong point but I love killing myself on the bike! The route down to Folkstone was fairly straight forward, heading towards Ashford and on. In the heat of the moment, you do see different riders take different courses and ultimately a particularly route may shave 20 minutes off etc. Certainly I found myself on some great country roads coming down from the A2 towards Maidstone, which may have been a great ride but heading down towards Faversham may have been best. Still I was on an ok time and was heading for the 2pm ferry in good time (the ferry departure times that people reached were 12pm (they had definitely practiced the route and were fast(, 2pm, 4pm). Ok start. 4miles from Dover, I got 3 punctures – 1 of which had been my own fault with a rushed inner tube fix. A stop in Halfords meant it was the 4pm for me. Still I meet some great riders, a former pro called David I recall and a member of one of only 4 teams (of 2) that had finished the race across America in the time limit. So not too bad considering. I had been advised to take the ferry over to Dunkirk rather than Calais, shaving 30miles off and about a dozen of us set out at different paces from the port. At this stage I was still getting to grips with the Garmin GPS and my original route had been from Calais (what I later discovered was the best way to utilise the device was to just find the best way to a particular location rather than set route). The roads were magnificant and we set a hard pace – 38kph average – which as my legs later got stronger was peanuts to the 42+kph I was setting with pros down the Italian coast. With 3 other riders we tackled the maze of routes from Oudenaarde towards Geraardsbergen and landed at the checkpoint at about 1am…..tragically as I found out when we reached the arranged hostel, those few hours from the ferry and confusion through Belgium made a huge difference in this race, as riders were setting out for day 2 as we arrived. Disaster. This was my first real test in doing big mileage day after day with little sleep so I just went into auto pilot as I set out at 6:30am or so the next morning. Got my route up on the GPS – after all it was set out from the first checkpoint – and off I went…..little did I realise that I had stupidly – and this bugs me to the day – brought it up in the wrong direction. It was only when I started focusing on my compass that I found that I had been going 2 hours NORTH!!! In a little bit of a panic at this stage I passed back past Geraardsburgen 4 hours later and heading east to Brussels, plenty of signs and well we had to go east, right? It was on the edge of Brussels though that the GPS really came back in its element. I stopped and calmed myself for a few minutes as I struggled to find a decent route south out of the city. I entered in south to Freiburg on the device and behold the route was there – A route which I must add I had past about 20minutes before, which consisted of quite a busy road (but only for 2 miles or so) and which I had dismissed because well frankly I didn’t want to be stuck on that busy road for 50-70 miles, not around a busy city anyway. But the GPS got me on the right track and I made my way down to Huy – wonderful town around a river. I was thinking of heading out through the night but my mind was fried and I was in no mood (or brave enough) to take on the dark country roads. Certainly that is an element of the race I struggled with throughout the two weeks – to make ‘real’ time and distance, you cant stop for 4-5 hours at night and you have to treat the night’s riding like the day. As the race went on, I made a semi rule of cycling til about midnight or around that time when I found a suitable bed, and then setting out at first light. 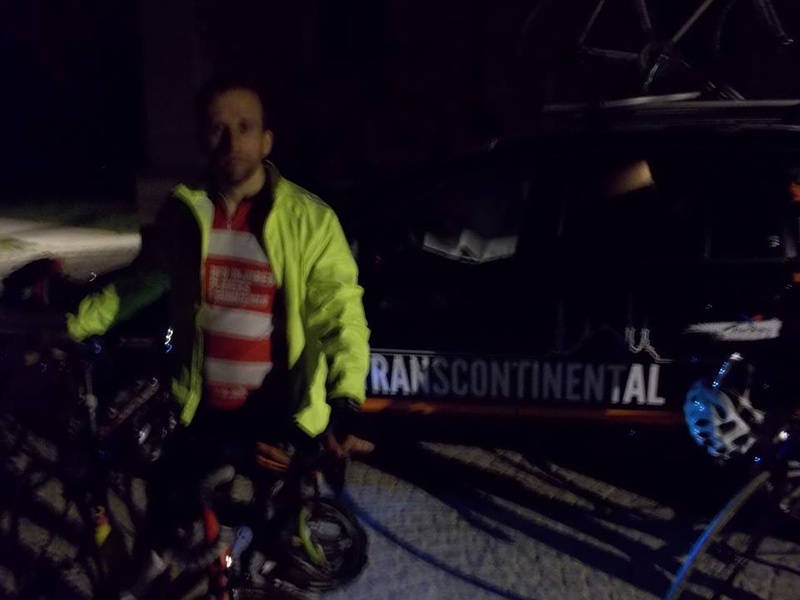 About 18hours cycling – 300km or so (depending) – that became the goal – and certainly as the days came one after another, it was this short term goal that kept me focused. So I had my first dose of camping out in my emergency foil tent and blanket that night, and well it isn’t too bad apart from the very quick movement in the morning to heat the body up! At this stage the memory gets a bit fuzzy, the rest of the pack were about 70-80-100miles in front of me and I had made a pitiful effort (in terms of distance) on day two. This was really when I decided to pick up the race at the scruff of the neck and stop worrying about cameras or notes or photos…..I had to go all out. The GPS lead me down towards Luxemburg City – in passing Luxemburg and southern Belgium are not flat (of course nothing to what comes later) but after the easy going coast road on day one, this told me the real cycling was just getting started. To be honest, trying to recall were I crashed that night is proving very difficult but I followed a German cycling group toward Metz in France….and then heading out towards Strasbourg……I really was going flat out….. This was the first taste of hills and mountains. I wanted to cross over the hills around Munster – towards Strasbourg and Freiburg – as it was meant to be stunning. I wasn’t disappointed. Solid ride into the early afternoon and I meet the Rhein canal at Erstein I believe. This was where I could pick up some distance and the flat canal lead me down towards Basel in Switzerland – had to chat to quite a few German campers to get restocked with fresh water – I would have killed for a cafe to just collect my thoughts and get rehydrated – but nevertheless, even after the easy going canal cycle path seem to have stopped at about Marckolsheim, I stopped on the German side of the border at Neuenburg am Rhein to get some food at a garage and recharge the GPS. Tell you what it all seems so casual when you are reading from Google Maps – you really earn each mile when you are out there!! Until about 1am-2am that night I made my way around Basel – through Weil am Rhein I believe – and got on the ‘3’ road towards Zurich. Thunderstorms lit up the nights sky and I dived for cover in a office complex courtyard. No point getting soaked right and got my head down for a few hours. In all this rush though and with the memory of the hot day I didn’t anticipate the drop in temperature. After a quick warm up in a lift! that next morning I set out for day 5 towards Zurich. I must admit by this stage I felt absolutely disgusting, after camping out for 3 nights in a row with only one dry kit. Luckily that morning I had convinced a hotel to let me use a shower and get breakfast, and so after a few days camped out, I felt refreshed and ready to go down towards checkpoint two in the Alps. On the road to Zurich I joined a Swiss triathlete for a hour or two and although the pace slowed it was nice to get some real company. I circled Zurich and made my way towards St Gallen. At this stage the GPS had died but I knew roughly the route and was quite confident with my compass reading! Without following the main roads, things get a little tricky in this area, with the changes in altitude of the road meaning that you often had to go back on yourselves to go the right way. Past Rapperswil I joined a cycle path down towards the Walensee – the scenery around here is absolutely spectular, you should look into it! Unfortunately for me but although Google maps make the route obvious, I followed the cycle path on the north side of Walensee and it ended. An annoying detour but for an afternoon cycle it was fantastic viewing. Back to the race…..it did occur to me the opportunity to ask for a lift on a yacht across to the south side but to avoid the lengthly negiotations involved, I decided to head back and crossed over at Weesen. Some very weird cycle routes this side, which has mind blogging gradient – some must have been 20-25%. 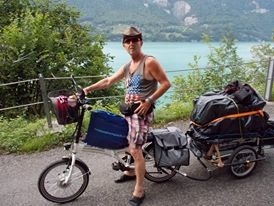 I did meet a great Czech character with Bon Jovi playing loading on an electric assisted bike – I post a picture when I get a chance, I think he had a cowboy hat on in fact. Avoiding the main roads and intimated by getting lost up some high mountain roads – lots of effort to come back down – I found myself stopped in a German bar/old hostel for the night. Can’t believe I lost the bar’s card, but this place was in about Saas im Prattigau along the main 28 road south. Two great Swiss guys – or should I say one, the owner, the other guy was pissed as a fart and kept joking with me in German – shared a beer with me in this quiet village alongside the now, mad, dangerous 28 night road. 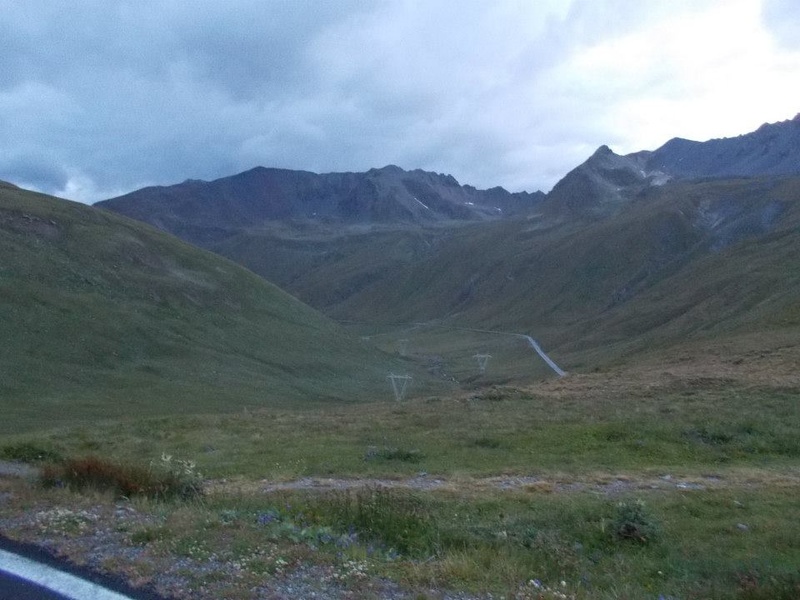 So as much as I had hoped, I didn’t reach the Stelvio Pass the day before. A former Italian pro cyclist – who had been in the Tour of Britain in 1969 apparently – had told me I wouldn’t make it and he was right….regrettably. Being stuck up a mountain at night with limited kit was not my idea of fun but unfortunately in my lovely abandoned hostel accommodation in Saas im Prattigau I overslept my alarm – well I think I whacked it off the bunkbed, and was woking by the owner and his Russian yet English speaking wife for breakfast, along with a couple who were guests at the hotel. After a small breakfast – I found it had to eat very large amounts at this point, being use to snacking for almost a week now – I heading towards the toughest day I had ever had on the bike. The Stelvio Pass – which is the second highest paved road in the Alps, by like 13 metres, wasn’t the only challenge of the day, as the every increasingly bad weather made the 2 or 3 mountain 2000m passes a real challenge. With no real energy in the legs this far in and little chance to recharge the batteries, or even settle down to some food, the Ofenpass and most notably the previous Fluela Pass was beastly. Having the wind in your face didn’t help. I caught up with two other riders up the mountains and we shared a few stories over some warm food and tea in Zernez (I believe). On the Stelvio Pass, we entered Santa Maria, me just a head of the other two with an early start from lunch. Regrettably I should have reloaded my fuel supply in the town because the 2000metre climb just keeps going. The gradient isn’t anything nasty but I bonked several times up there. Fortunately I had some generous car drivers – one group that even got food from the top and brought it back – that keep my head straight til about 1300metres from the top. I was spent and just as the clock turned 9pm I walked the last 1500metres or so, with several attempts to balance myself on the bike however the head was absolutely spinning, to the top. After a quick look for the checpoint crew – I should have come up another side of the mountain I am told, I ‘collasped’ into the mountain top hotel – mind you shared some stories with quite a few tourists at the top. Mission accomplished. I understand I had made some good time on the other riders who had just got down the mountain the night before. Unfortunately the quick descent meant that I waited until first light to go down the mountain towards Bormio. Absolutely freezing and certainly had to keep your wits about you but it was fantastic coming down right from the top of the Alps. It seems most riders went down via Meran and towards Trento…which in hindsight would have been best. At the time I was concentrating on getting down south asap. I needed to get down to Bari in Southern Italy as quickly as possible and I knew that this gamble down through the Adriatic Italian coast could make up time on the riders heading into Slovenia. Unfortunately the mountain ranges lay in such a way that you head down to Sondrio, along lake Como and as my GPS dictated up a small mountain climb around Lecco. The aim was just to get south and slowly head back Southeast as I got to the flat plains around the plain of Lombardy. As night flew, just as I had done in Southern France – it is coming back to me now – I just focused on the Garmin beeps – left, right, straight ahead. When my back bike light failed around Cremona I decided it would be stupid and dangerous to keep going on the fast roads. I arrived at a casino/whiskey tavern in the middle of nowhere and these 3 barmaids – the poor girls had no idea what to make of this figure that had just come out of the darkest – made me up a bed in the outside Gezbo. The whole trip was a collection of favours – which I am incredibly grateful for – early that night in fact I had had my back light replaced by a group of Italian guys in the pub, but unfortunately that two failed or in fact I think it got broken as I put my bike down exhausted at about midnight!! Phew this was a long trip. Day eight started with a bit of difficulty as I spent about 1 1/2 hours trying to wake the bar owners for what I thought was a charging GPS – the bar power socket must have been switched off as the GPS cut out a hour or two later – damn it! A mistake that at least I like to say can be easily done, well when you are manically trying to catch up to the 6-7 place guys. By this stage the winner had already gone through the finish line – machine – and it was all about a decent effort. With a unenergized GPS I headed toward the southeast city with the most road signs – Bologna. Even looking at the map, the details of the day are hazily, but after some epic lightening I hid out in a hotel about 20km outside of Bologna for 35euros – with breakfast! It was mega. So I admit the body was pretty beaten by this stage and I slept in til about 8am. I knew I had to stick my finger out and loaded up with a big breakfast, round after round of bread and salami, and set out for the coast road. I had aimed for Rimini the previous day and directions proved to be epically simple, with a course set via Ravenna, Cervia and Cesenatico. Apart from a nasty hill side in Ancona, the ride down was fast and flat. I meet numerous Italian cyclists on the way down, one particular guy I called the Ferrari, with legs like tree trunks, basically like Chris Hoy. Certainly he didn’t look out of place next to the Olympic German cycling team that I had chased around Sondiro in northern Italy. I also meet a English couple near Senigallia while asking for directions at a petrol station. It was funny but I feasted on that couple of minutes of conversation after all the communication fustrastions of the last few days. Coming out of Ancona is a bit of hurdle and I am positive I went up one hill road twice – trust me as a cyclist you learn very quickly that most people know the way out of town through a highway but not something for our two wheeled hobby. As much as I was pushing for a 20+ hour cycle I knew the eyes were getting heavy now – the legs are your solid base, they aren’t the thing that fails on you! – and even with a massive pizza and double expressos in Civitanova I knew I needed just a few hours kip. By this stage I was on the busy coast road – busy with tourists mind you and a quiet spot to camp was just not an option. Plus I knew that to get to Bari in 24hours I would need to revive under a warm shower. At about Pedaso I found a campsite, who’s owner, a nice young guy who sat me down for a beer before bed in fact, let me camp inside the compound. No new blankets but at least no worry of passing traffic or drunken tourists! My internet access for the whole trip had been limited to some friendly bike shop owners, a few cycling teams in cafe’s with smartphones or as I hope was sent – the campsite the previous night sending emails on my behalf. Anyway, I recall at this stage I knew that the 3 riders going down Italy would be approaching Bari that day and I hoped that if I could make good time/great distance they would be caught up in the ferry terminal, and not only could I catch them if I was lucky but with the distance covered while I slept on the ferry, maybe catching up with some of the higher placed riders. Going down to Termoli was easy, in fact I remembered cycling with a Italian Superbike Rider to Pescara. As the road bends in towards San Severo and ultimately Foggia thats when confidence gets a bit weak – after all hugging the coast for 36hours made you think this was easy. A recharged GPS that evening got me off the truck filled roads around Foggia but with no light and tackling D class roads progress was slow. These D class roads, although silent also twist and turn, taking hours to go the 50km I just pulled out in an hour & half from Lesina to Foggia – bike times and distances go out of the window a bit after this length of time on a non-stop trip with kit (at least if you are not with the leaders) but it is amazing how satisfied you get after doing a good 50km. Sad really. I settled down for a night’s sleep under the stars, and bonus this time it was on a lovely grass blanket, its the little things. I was now aiming for a ferry whos departure time I didn’t know – after all the Italian job was an idea only a few days old – would have been nice to do SOME research before hand! By Corato or was it Bitonto, I crawled into a small ball outside of a Lidl, trying to recharge the batteries on milkshake, flapjacks, coke, orange juice, etc etc. As good as the flexibility of ‘wild’ camping is, when you get up and do 2-3 hours of riding before breakfast, the crash is pretty awful. Finally though Bari. Job done……now a 12 hour wait damn it! I must admit, my options were zero now, I had to wait for the ferry and two pizzas and several beers & cokes into the ‘fuelling’ in the port I didn’t care. Also internet was a major priority, with a SPOT tracker that had failed in Switzerland – I am now told it was the batteries, even though I got them checked coming down the mountain in Italy – no-one knew where I was for 48hours. Some kind American tourists negiotated with probably the best hotel in Bari – Palace Hotel I recall – to let a smelly cyclist use the internet. Thank you. There was no favours on the ferry and the crew offered me only a full cabin – with 4 beds – for a full price of 110euros. I found a couch in the crowded lounge which was closely guarded by my new Albanian friend – who I thanked with beer. We arrived into Durres at about 8am…..as I am finding out now with my trains across Eastern Europe this could be an end to my on time public transport! In the GPS it was 166miles to Thessaloniki. 3 days and I am in Istanbul I thought. The nerves were high setting out in Albania but I soon found that apart from some mad over taking coming towards me the drivers were pretty good in giving me room. 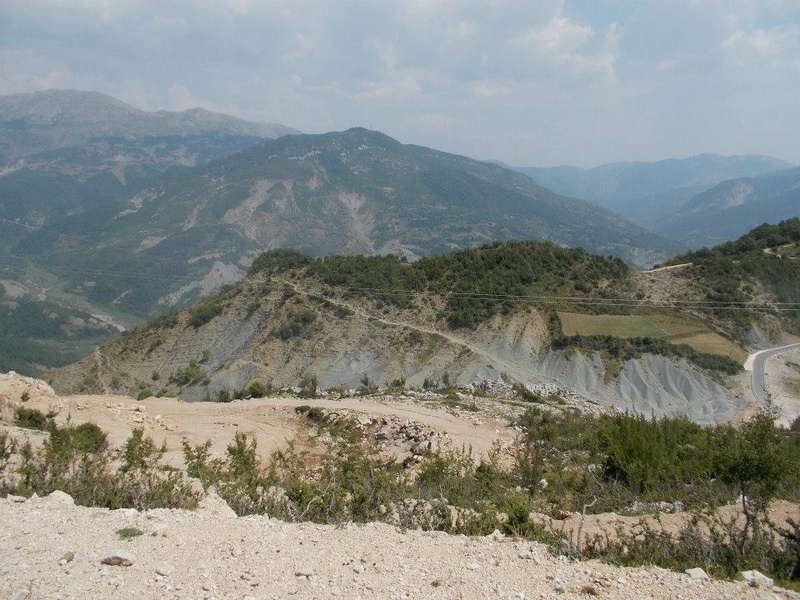 I was quickly through Tirana (the capital) and into the Dajti Mountain National Park. The route on my GPS was southeast over the mountains and down into Greece. Now with a full stomach no problem. As I look at Google maps now, the roads stop at Bize…..I kept going……was a new route through Italy and Albania such a good idea I know thought? Then real trouble happened. Bike tyre got shredded 4hours up this mountain and my cleats got wrecked walking the 5hours down the other side – keep moving the right way I thought. Reaching a bar as the sky got dark I knew at least I had accommodation for the night but the bike was a problem. A hole has been ripped in the rudder and no matter how many times I changed the inner tube, it was puncture, puncture, puncture. Needed new tyre I thought. As much as I wanted to get down to Librazhd about 20km away, I was informed that to get my bike and now my cleats in order I would have to go back to Tirana. And with that it all happened in a flash I got a lift from a friendly driver in the bar and 5-6 hours later I was having dinner with his family in Tirana. Surreal. Through the newly studied english of their daughter I informed them I had to set off early in the morning in search of an internet cafe to locate a bike shop. Even with an internet cafe found a bike shop was looking bleak but some young lad joined me from the cafe and took me on a bus through the city to find this elusive cycling mecca. With a few visits here and there and some detours for working ATM machines I found myself in a bike shop owned by an Albanian who had lived in Islington, London – even had a London accent. Very helpful guy and even with two orders for the ‘specialized’ bike cleats as I set out from Tirana at lunchtime they just wouldn’t fit in normal riding – I was push power only now. As recommended I headed south the Elbasan and Korce, stopping in a hotel just shy of the Greek border at Krystallopigi. Hard ride, as shown by all the mountain shadows on Google maps, but at least I was at Greece, maybe I could make the cut off in 48hours or at least be in touching distance. In the hot Greek sun it felt like I went over every mountain in the north. Through Krystallopigi to Kastoria was a wonderful ride, absolutely flew down the mountain passes at 40+kph average – bear warnings everywhere so you can imagine the kind of untouched scenery. 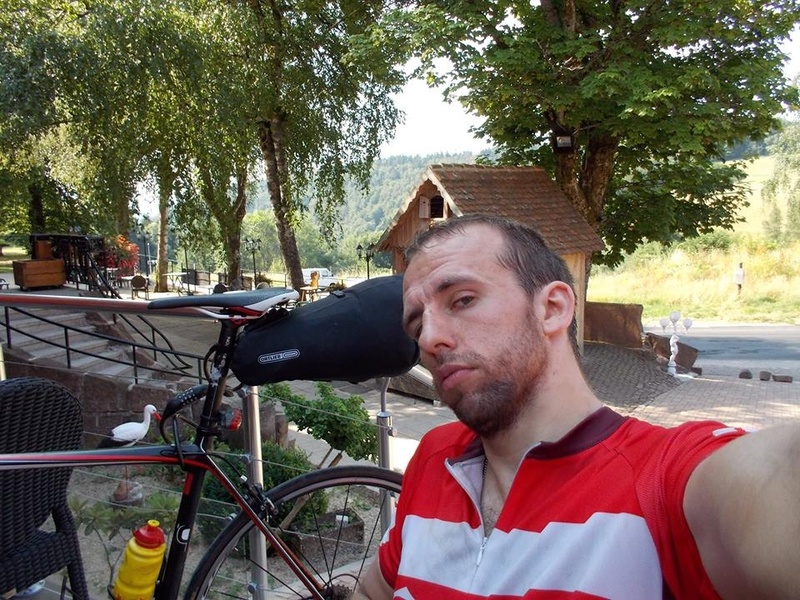 The one thing on my mind was food – I really was struggling after no proper food since the late afternoon before, and once again I recuperated outside of a Lidl on the Kastoria lake peninsula. With the chuckle of some helpful direction givers (I had got used to people thinking cycling across Europe at that speed was stupid), I headed towards Kozani, making every effort to stay close to the path of the main highway through side roads or service routes. Direct line I thought. At Polimilos (coming up to Veroia) there is a monster of a hill that just keeps going – I swore I wouldn’t do anymore hills! – but the 4 road was relentless, up and up. But like every hill there is a reward and for the next 20km I sat on my pedals and flex down towards Veroia, pedalling when only essential! And then we had Veroia. And that sandwich. I resupplied in the town, ready to take on the route to Thessaloniki and a bit further down the Greek coast. Replenished I made my way through Alexandria and into the busy Thessaloniki city – I had after all not been in a busy environment since the Italian coast – well tourist environment anyway! The plan was to keep going through the city and after a missed turn on to the ‘2’ route, keep heading east on the ’16’ towards Galatista and then back on the 2. Game over. You know you are beat when you and your body doesn’t care what race you had been in for 14 days. Ultimately I found out that I had bad food poisoning in the hospital. That morning at 5-6am I had searched out a hotel to recoup for 24hours but failing that an airforce base called an ambulance. Apparently it was pretty nasty so probably for the best! Although the worst was gone after 7 hours, I had to resign to the fact that my race was done and 48hours later I shipped my bike back to Ireland – via a very kind friend of a friend. I now set off to Singapore on an overland train journey. Soon after I left hospital I jumped on a bus to Sofia – still in some smelly cycling clothes – then from Sofia the following night to Belgrade and now I sit in front of computer in Budapest. Right time to get myself in order for the train towards Kiev. I’ll try to get the few photos I have up asap! I will also put together an article on top tips, where you can go wrong on a trip like this and I would like to put something together on the winners/leaders races. Ultimately this trip is more than just cycling. All the riders could do 300-350km a day, granted the 400-450-500km is tricky to say the least. Getting lost and having problems not only uses up time but knocks your confidence and uses up valuable energy – even if it ‘just’ makes you feel tired. After this trip I know I had a 12, perhaps even 11 day cycle to Istanbul in me but, and I am not trying to make excuses because ALL riders had problems and that is a fact of life about the race – it is WHY it is so challenging – I messed up quite a lot. I hope to take this knowledge on how I felt on some big rides, the determination of staying focused for 18hours or so, forward and perhaps join some cycling teams in Singapore. For now I am trying to get my weight back on and I am not going to take future plans too seriously until I reach my Asia destination – after all I will be sitting on trains and buses for 6 more weeks. There will be new adventures though. Stay tuned. Great account; I really felt the pain and the pleasure you experienced along the way – thanks for writing!